While California’s ability to count ballots runs contrary to the otherwise dazzling march of progress, by now we have enough information to offer a pretty good look at California’s state Legislature for 2019-20. The Democratic supermajority has been re-established. 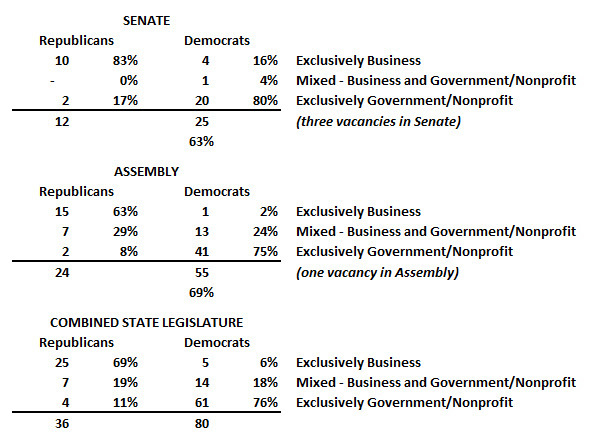 With 28 confirmed seats in the Senate, and 56 in the Assembly, the Democrats hold 70 percent of the seats in both houses. Even if Republicans achieved the unlikely capture of all four Assembly seats that remain too close to call, nothing would change. Overall, so far there are 84 Democratic legislators, and only 32 Republicans. 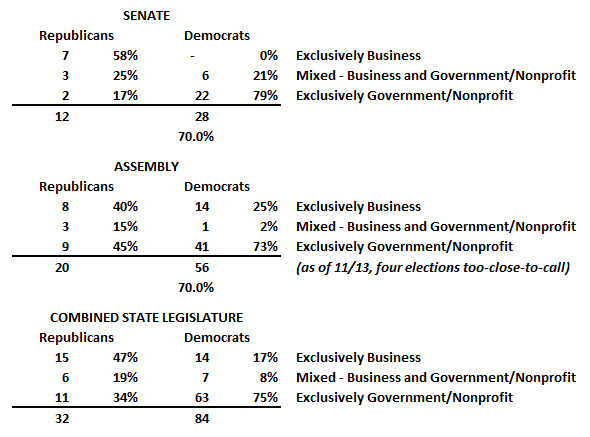 Three election cycles ago, a California Policy Center analysis compared the biographies of California’s state legislators, asking how Republicans and Democrats differ in terms of what they did before they became politicians. To repeat this exercise, 2018 election results were obtained from the California Secretary of States “District Races” page for the Senate and the Assembly. For incumbents who were re-elected, biographies were obtained from the Senate and Assembly websites. For newcomers, a trip to Wikipedia, Ballotpedia, or their campaign websites was sufficient. When the Legislature finally adjourned at the end of August, it again screamed the need for a return to part-time operations. The “reform” of the late 1960s that imposed a full-time gathering of busybodies in the Capitol was one of the state’s biggest mistakes. Misguided voters passed Proposition 1A in 1966, the same year they put Ronald Reagan in the governor’s chair. The first thing the new full-timers did was pass a massive tax increase. Reagan had campaigned against any tax increase. He broke that pledge and signed $1 billion in higher taxes, equivalent to something like $20 billion more today, the highest state tax increase in history. Fast-forward to 2016 and the Legislature passed one absurd bill after another, many supposedly “helping” the poor, but actually hurting them. The farm worker overtime bill has been covered by my colleagues and I here at Fox and Hounds. Supposedly the “program” dedicates the money toward such allegedly pollution-reducing actions. But in government, all money is fungible. With legislative legerdemain, it would be possible to switch the $900 million to pay, for example, for some of the $250 billion in the state’s unfunded pension and medical care liabilities. The electric car subsidies largely go to rich Tesla drivers, with the cost picked up by poor people forced to drive long distances in old cars because housing is cheaper away from the expensive, job-rich areas along the coast. New parks might be nice, but why not let localities decide that? And how will the money be spent? Remember the parks scandal where the director, as AP reported, “sat on nearly $54 million in surplus money for years while parks were threatened with closure over budget cuts”? But the most absurd part of the cap-and-trade flim-flam was “pedestrian-friendly affordable housing.” Where will poor people park their cars? Once again: Because coastal areas are prohibitively expensive, poor people either bunch up in homes, often illegally; live far from jobs and drive long distances; or sleep on park benches. If the “pedestrian-friendly affordable housing” is erected in coastal areas, and the homes are nice, that’ll be another manipulation of housing prices – which always means overall higher prices. Take New York City – please. Massive subletting has led to spying on tenants. One supervisor just was fired for refusing to spy. If the Rotten Apple just would end all rent control, money would flow in to build new apartments, the greater supply then would reduce overall prices. Oh, and rent control there was a “temporary” expedient during World War II. City politicians haven’t heard that Hitler blew his brains out 71 years ago. As they say in Hollywood: Time for a reboot. Ideal time: November 2018 ballot. As the final day of the legislative session dawned last week, taxpayers were cautiously optimistic. After all, we had already stopped the most direct threats to Proposition 13. Those included Senate Constitutional Amendment 5, which would have weakened the rules regarding how some properties are valued for tax purposes and Assembly Constitutional Amendment 8, lowering the two thirds vote at the local level for taxes and bonds. Another success was notched by derailing an eleventh hour effort to make it much easier to raise property fees by broadly redefining sewer service to include storm water runoff programs. While seemingly arcane, this would have exposed California homeowners to billions of dollars in new property levies without direct approval. As for more debt, taxpayers should be pleased that two multi-billion dollar bond packages, on parks and affordable housing, failed to clear the Legislature. Now for the bad news. On the last day of session, our tax-and-spend legislature hit California consumers with a new tax on car batteries by passing AB 2153. This $1 tax on consumers will be paid at the point of sale, as will a $1 tax on manufacturers to be passed onto consumers. After 2022, the $1 tax on manufacturers is added to the consumer total increasing it to $2, and the tax is made permanent. While the revenue generated purports to deal with legitimate environmental issues regarding battery recycling facilities, thanks to AB 2153 receiving a two-thirds vote, the money can simply go into the General Fund and be used for any purpose. Under the category of illegal as well as foolish, the Legislature authorized local municipalities to spend public money for political campaigns. Beyond the obvious argument that taxpayers should not be forced to finance campaigns with which they might disagree, Senate Bill 1107 is also in direct violation of the Political Reform Act which expressly prohibits such financing. To avoid costly litigation over the validity of SB 1107, Governor Brown could do taxpayers a favor by vetoing this bill. Speaking of illegal, Assembly Bill 1889 seeks to spend hundreds of millions of taxpayer dollars on California’s showcase boondoggle, the High Speed Rail project. The legal problem is that access to the bond proceeds is conditioned on several requirements, including partial funding from federal and private sources, speed requirements and no public subsidies for operating expenses, none of which the High Speed Rail Authority can possibly meet. Again, in the absence of Governor Brown’s veto, litigation over sale of the bonds is a certainty. From the perspective of fiscal sanity, it is a shame that every two year legislative session in California is an exercise in trying to prevent damage to taxpayers and the economy. Rarely is there anything remotely worthwhile in the hundreds of bills passed by our esteemed political leadership: No pension reform, no education reform, no civil justice reform or tax reform. While other states run clean, effective and efficient governments, the California Legislature resembles a three ring circus more times than not. Unfortunately, it is not getting better. In the session that just ended, even some of our allies (or so we thought) cast horrible votes in favor of tax increases. As bad as things are, this November’s election could spell disaster for California’s beleaguered taxpayers. Tax hikes at the state level require a two-thirds vote of each house and we now know that a legislator’s proclivity to raise taxes does not necessarily depend on party affiliation. For taxpayer advocates, this is going to make our job of defending ordinary citizens in the Capitol much, much harder. This piece was originally published by the Howard Jarvis Taxpayers Association. A California gun rights group filed a federal lawsuit in Sacramento on Friday after the Legislature’s lawyer blocked a blog post that listed the addresses of lawmakers who recently supported gun control legislation. Shortly after Gov. Jerry Brown signed a package of gun control measures July 1, a conservative blog posted what the author said were the home addresses of 40 legislators. The author pledged to keep the names up until lawmakers vote to repeal the laws or die. The Office of Legislative Counsel demanded that WordPress, which hosted the blog, take down the post. The demand was based on a state law that forbids someone from posting the home address of an elected official with the intention or threat of causing great bodily harm, or if elected officials or their representatives demand that they not be published. As the Legislature reconvenes this week for its final month of business for the 2015-2016 legislative session, NFIB California reflected on victories and challenges ahead per the “The Good, The Bad, & The Ugly” bill list. Bills included in this list represent those which will have the greatest impact, either negative or positive, to our 22,000 small businesses across California. As we enter these final four weeks of the legislative session, NFIB is prepared to hit the ground running to ensure the voice and interests of our 22,000 small business members, and their hundreds of thousands of employees, are heard regarding our remaining priority issues. NFIB was proud to help stop a handful of ugly bills such as SB 878 (Leyva), the Predictive Scheduling Mandate, and SB 1161 (Allen), the ‘California Climate Science Truth and Accountability Act’ so far this year. However, several bad bills remain alive and we are prepared to put forth every effort to protect small business in these final weeks. Environmental mandates, transportation taxes, protected family leave, and agricultural workers’ mandates are some of our top policy concerns as the legislature wraps up this two-year session. Given the current lack of transparency in the legislature, it is impossible to know every issue that will be brought up since bills can, and will, be gutted-and-amended without notice to the public. AB 2757 (Gonzalez), which mandates overtime pay for agricultural employees, is a perfect example: this bill died on the Assembly Floor months ago, but has resurfaced in the form of AB 1066 without full committee scrutiny. In the first half of the legislative session, we witnessed how swiftly the Legislature can ram through devastating public policy with the enactment of Senate Bill 3 (Leno), which increased the state minimum wage to $15 per hour. Therefore, our 22,000 members will be highly engaged and informed on these policy issues with a regularly updated ‘The Good, The Bad, & The Ugly’ bill list. Currently, the list includes 39 bills total (23 active): 14 good (5 active); 7 bad (6 active); and 18 ugly (12 active). This list reflects proposals from the 2015-2016 legislative session, and as new bills are introduced or morphed into substantively new bills, this list will be updated. You can always find the current version at http://www.nfib.com/ca/gbu. Are Environmentalists Losing Influence in Legislature? In a strange twist, the document making the rounds in media circles showing de Leon’s endorsement of Brown contends that Leyva and all his fellow Senate Democratic leaders agree with him. “I support Eloise Reyes. Period. Somehow the pro tem must have misunderstood my position, although I thought I was quite clear,” Leyva told The Los Angeles Times. Phillips, who works out of Sacramento, is a white UC Berkeley graduate who used to work for the Environmental Defense Fund. Brown, who turns 72 next week, has been a fixture in the Inland Empire African-American political establishment for more than three decades. She co-founded a weekly publication that focuses on black issues in 1980 and has worked on a wide variety of African-American causes in western San Bernardino County. Ridley-Thomas is a vocal supporter of de Leon’s efforts to have a Superfund-type cleanup of the Exide battery plant in Vernon.